Allyson Geer-Park was only 12 when she had a choice to make. She found success in local Michigan events, but when she got into her first AJGA tournament at Chateau Elan in Georgia she missed the cut. Unsure if she could hack it with the uber-talented national golf competition, Ally, 12 going on 20, talked to her parents about her future. One year after missing the cut at Chateau Elan, Geer-Park returned to the same event. This time she won. Brad and Andrea Geer have three girls, Jessalyn, Allyson and Kassidy, all about three years apart. Looking for a family-friendly activity when the girls were young, Brad, a golf nut, decided to take family outings to a nearby course. Kassidy, the youngest, was strapped in the car seat in the middle of the cart. They’d spend most of their time feeding the ducks and running back to pick up Ally’s forgotten wedges, but the girls were hooked. Brad cut down an old set of golf clubs and put new grips on them for all of his kids — as a “Golfsmith addict,” he was having a ball. 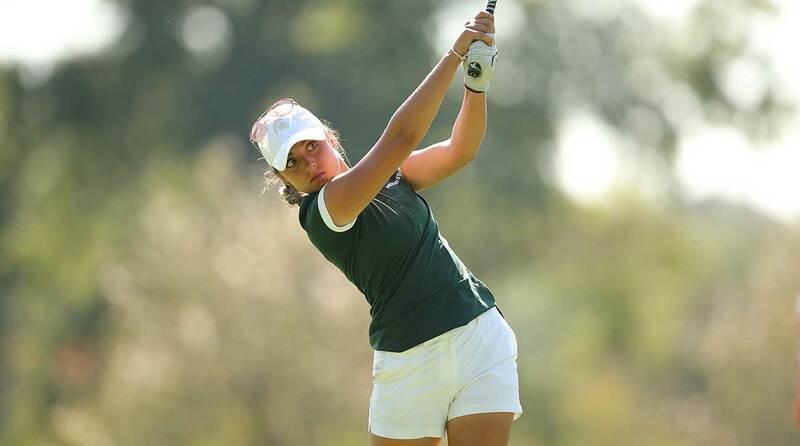 Geer-Park has already won twice this year for the MSU women's golf team. Golf has remained a big part of their family, especially for Ally. Mature beyond her years, ever since she committed to the game after that missed cut at 12, her life has transformed. She gave up dancing and ironed out a more productive golf schedule, and home-schooling with her mother gave her flexibility. Most days she’d be up early with homework before arriving at Oak Pointe Country Club in Brighton, Mich., around 10 a.m. She’d practice until lunch time. Depending on how old Ally was, sometimes her mom was there for lunch, sometimes she’d drive up the road and drop it off and, sometimes, she’d surprise her daughter with books and homework to review. Ally would return to the course and practice until about 4 p.m. — around the time the after-work crowd busied up her office. When she got home, school was in session. All of the Geer girls were home-schooled when they were younger and had the option to choose where to go next. Ally was the only one who decided to stay home-schooled, which allowed her more time to travel and play golf. Schoolwork traveled as well, as she often hit the books with her mom or dad while at hotels between tournament rounds. Victories piled up, and she committed to Michigan State after her eighth-grade year. She won the 2015 and 2016 Michigan State Amateur Championships — becoming the youngest player in the last 23 years to repeat — and enrolled at MSU early, where she was named Big Ten Freshman of the Year in just half a season. As a sophomore she recorded the second-lowest single-season scoring average in school history (71.61). Geer-Park has received two sponsor's exemptions into the Meijer LPGA Classic. She was in one of her communications classes in January when her phone erupted. We make a great team, on and off the golf course. While some ANWA competitors will elect to use club caddies on their bag if they make it to the final round at Augusta, Ally will enlist her husband. She wed former Eastern Michigan golfer Nick Park on Aug. 4, 2018, 12 days before she turned 20 and a day before catching a flight to the U.S. Women’s Amateur. Nick has caddied for Ally in her LPGA and Symetra tour sponsor’s invites. He’s also pumped to get to Augusta. “I don’t know who is going to have a bigger smile on their face, her or her husband,” Brad says. As for Ally? She’s excited to be among the group who will make history in the inaugural event.